Breaths in CPR are still important but why? Do you get told that breaths in CPR are not needed? Do we even need to complete mouth to mouth in CPR? Please read further to see how important breaths are in CPR really are! On our courses, we have had many remarks and discussions as to why we do breaths in CPR. Our feedback from learners; they have been told or read that breaths in CPR are not needed and to only perform compression’s. The British Heart Foundation, quotes ‘if you don’t want to give rescue breaths, Hands-only CPR is still likely to increase a person’s chance of survival. Never do nothing.’ There is evidence people refuse to do any CPR as the idea of mouth to mouth puts them off completing breath in CPR. People are more willing to push on someone’s chest than to breathe into them. However, breaths in CPR are incredibly important and further increase the casualty’s chances of survival. If you are trained, you still need to give breaths in CPR but why? If an adult has a Cardiac Arrest, the heart stops abruptly, they will still have residual oxygenated blood in their system and therefore their blood will be well oxygenated. In this situation compression-only CPR may be effective for the first few minutes, (roughly 3 or 4 minutes.) After this time, they will start to run out of oxygenated blood. 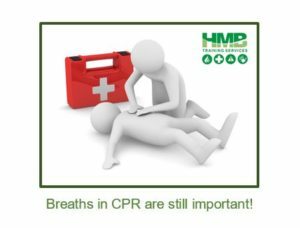 The advice from the British Resuscitation Council and the British Heart Foundation remains – breathing for the casualty, combined with good compression’s, is the most effective form of CPR and gives the casualty the best chance of survival. CPR by itself will not restart the heart, but it ‘buys time’ for the emergency medical services to reach the scene. Effective CPR more than doubles the chance of someone surviving a cardiac arrest. On the other hand, children do not have the ability to retain oxygen in their system and therefore it is even more crucial that rescue breaths are administered. Thus, for children it is advised that you start with 5 rescue breaths – tilting the head to take the back of the tongue off the back of the throat and breathing into them to make their chest rise. This should then be followed by 30 chest compressions, pushing down on the chest by about a third and pushing hard and fast. Get an ambulance on the way and then continue: 2 breaths: 30 compressions…. Agonal gasps, I hear you say, what are they? Gasping has been described as snoring, gurgling, moaning, snorting, agonal or laboured breathing. However, bystanders often misinterpret gasping and other unusual vocal sounds as breathing and do not call 999 or begin lifesaving CPR quickly enough. Agonal breathing (occasional, irregular gasps) is common in the early stages of cardiac arrest and is a sign of cardiac arrest and should not be mistaken for a sign of life. Agonal breathing and limb movement can also occur during chest compression’s as cerebral perfusion improves. During our DR ABC primary survey, we check for normal breathing, by listening, looking and feeling for chest movement. If no breathing is present we continue with CPR and ignore the agonal gasps. 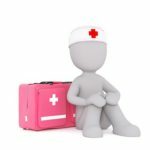 https://www.hmbtrainingservices.co.uk/ provide fully regulated first aid courses for groups and individuals at their venue or on our training rooms. Breaths in CPR are important! HMB Training Services provides this information for guidance and it is not in any way a substitute for medical advice. HMB Training Services is not responsible or liable for any diagnosis made, or actions taken based on this information. This entry was posted in courses, cpr, firstaid, paediatric, Uncategorised, walsall and tagged breaths, breaths important, cpr. Bookmark the permalink.